The breast cancer TNM staging system is the most common way that doctors stage breast cancer. TNM stands for Tumour, Node, Metastasis. Your scans and tests give some information about the stage of your cancer. But your doctor might not be able to tell you the exact stage until you have surgery. Doctors may also use a number staging system. Here is a slightly simplified description of the TNM staging system for breast cancer. Tumour describes the size of the tumour (area of cancer). This is a simplified description of the T stage. TX means that the tumour size can't be assessed. Tis means ductal carcinoma in situ (DCIS). T1 means that the tumour is 2 centimetres (cm) across or less. 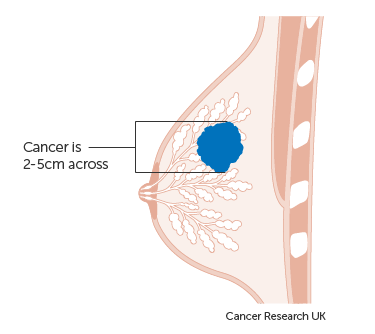 T2 means that the tumour is more than 2 centimetres but no more than 5 centimetres across. 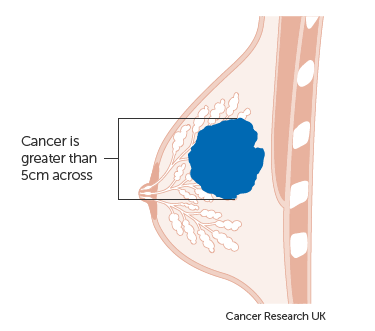 T3 means the tumour is bigger than 5 centimetres across. Node (N) describes whether the cancer has spread to the lymph nodes. NX means that the lymph nodes can't be assessed (for example, if they were previously removed). N0 means there are no cancer cells in any nearby nodes. Isolated tumour cells (ITCs) are small clusters of cancer cells less than 0.2 mm across, or a single tumour cell, or a cluster of fewer than 200 cells in one area of a lymph node. Lymph nodes containing only isolated tumour cells are not counted as positive lymph nodes. N1 means cancer cells are in the lymph nodes in the armpit but the nodes are not stuck to surrounding tissues. pN1mi means one or more lymph nodes contain areas of cancer cells called micrometastases that are larger than 0.2mm. Or the nodes contain more than 200 cancer cells but are less than 2mm. pN1a means that cancer cells have spread (metastasised) into 1 to 3 lymph nodes and at least one is larger than 2mm. pN1b means there are cancer cells in the lymph nodes behind the breastbone (the internal mammary nodes) found with a sentinel node biopsy but the areas are too small to feel. 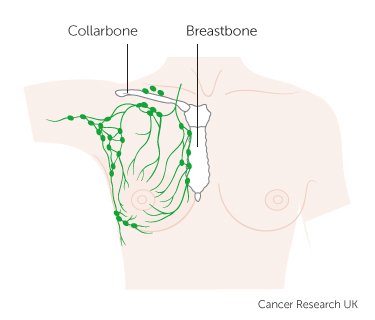 pN1c means there are cancer cells in 1 to 3 lymph nodes in the armpit and in the lymph nodes behind the breastbone, but they are too small to feel. N2a means there are cancer cells in the lymph nodes in the armpit, which are stuck to each other and to other structures. 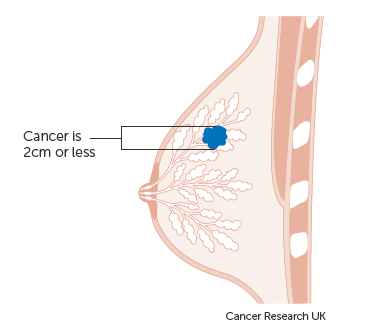 N2b means there are cancer cells in the lymph nodes behind the breast bone (the internal mammary nodes), which have been seen on a scan or felt by the doctor. There is no evidence of cancer in lymph nodes in the armpit. N3a means there are cancer cells in lymph nodes below the collarbone. N3b means there are cancer cells in lymph nodes in the armpit and behind the breastbone. N3c means there are cancer cells in lymph nodes above the collarbone. 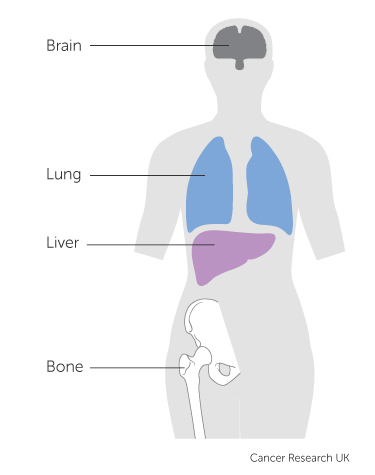 Metastasis (M) describes whether the cancer has spread to a different part of the body. M0 means that there is no sign that the cancer has spread. M1 means the cancer has spread to another part of the body. Your doctor will take many different factors into account when deciding which treatment is best for you.